Students asked questions over video to teacher-astronaut Ricky Arnold at the Spruce Street School in New York this week. NEW YORK — NASA astronaut and teacher Ricky Arnold called a group of students from space to tell them about life as an astronaut: what scares them, how to dodge space junk, what Earth looks like from space, and how the students could someday get to space, too. 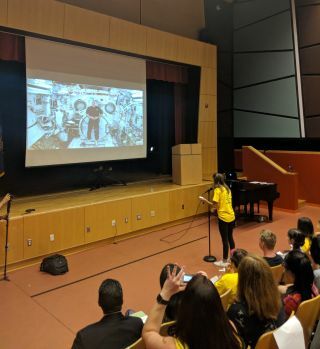 On Monday (June 25), students at Spruce Street School in New York City received a call from the International Space Station, getting the chance to ask Arnold their most pressing questions about spaceflight as he floated around the station. Arnold talked about what life in space is really like, and encouraged students to get involved in subjects such as science, technology, engineering and math (STEM). The call is one of three live events that are taking place across the country as part of NASA's Year of Education on Station. Of all the rewarding aspects of being an astronaut, Arnold described one of his favorites aboard the space station: the view. "Looking back at our home planet [from the space station] is a life-changing experience," Arnold said. He expanded on that comment, describing the "piercing color of blue" when looking out into space. He added that "when you get up here and look out of the window for the first time, all you want to be able to do is take everyone you've ever met and bring them up here to have a chance to look back on our home planet and realize how special and beautiful it is." Arnold described various aspects of life on the space station to the students. He said that enjoying and photographing the view was definitely what they like to do most for fun, adding that the astronauts also like to read and play guitar in their time off. But life in space isn't all fun and games, he said. Aside from the hard work, Arnold told the students about some of the scariest moments that astronauts can face. Fire, ammonia leakage and losing atmospheric pressure are the three scariest scenarios aboard the station, Arnold said. But while the astronauts are equipped to handle anything, he said that false emergency alarms in the middle of the night can be terrifying because at first, they don't know if the danger is real. Arnold also explained some of the difficulties astronauts encounter when dealing with space junk, adding that trying not to hit space debris is like a "game of dodgeball." He said that he sometimes even sees "falling stars beneath us." For students looking to follow in his footsteps and become astronauts, Arnold's key piece of advice was to "be a well-rounded person and be persistent! Keep applying!" After Arnold floated away from view in the video chat, the students got to address more questions to a panel of scientists and education experts from NASA. Matthew Pearce, the education officer at NASA's Goddard Institute for Space Studies, further encouraged the students to get involved in STEM and pursue STEM careers, saying that "half of our workforce is retiring within five to 10 years." Pearce used his own experience and path to NASA to inspire the students, saying that when he was a kid he thought: "I can't get a job at NASA … and I was wrong." "There's a job for everybody at NASA," Pearce added. The panelists, whose backgrounds included film, chemistry, physiology, education and more, shared the unique experiences that led them to work at NASA, letting the students know that they can pursue different career paths and still be a part of NASA and spaceflight. And, while many students in the audience were most excited to learn that the internet connection on the space station is pretty good, getting to talk with an astronaut in space seemed to inspire everyone in the crowd. Pearce left a final nudge of encouragement with the students as they left, saying, "I hope to see you in space."